But really, there’s actually a very good reason why I left out the third milk in the traditional Tres Leches Cake. I’ll get to that. 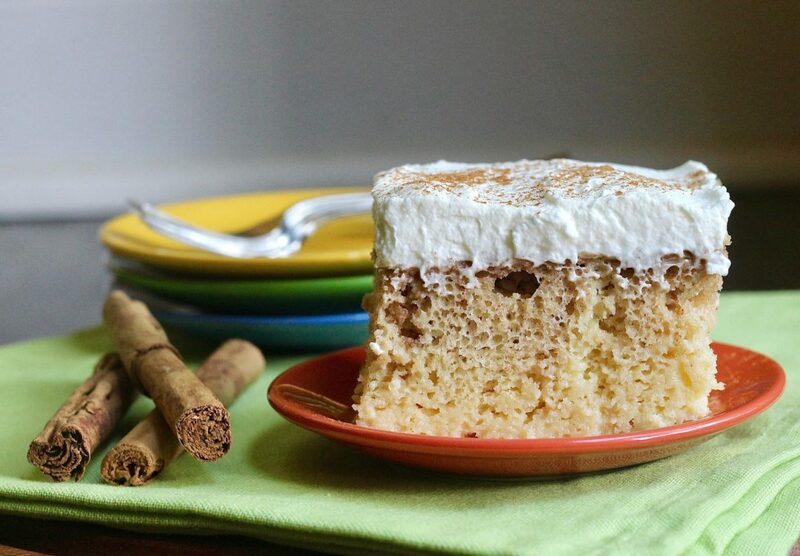 Tres Leches cake is a sponge cake (but sometimes a butter cake baked to be dryer than usual) that you pour three different milks over, therefore making it a ‘wet’ cake. 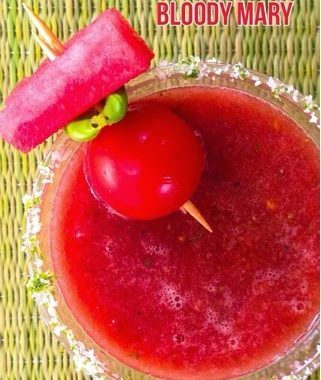 It’s popular in Central and South America, so I generally make one for Cinco de Mayo when we entertain. I’ve made it so many times before and a lot of times it just comes out overly wet and soggy and therefore not incredibly appetizing, to be honest. Every time I make it, I tweak with the recipe… which explains why you haven’t heard about it. So, here’s the problem- I actually think it’s silly when recipes call for parts of things that should be used up completely. Like, 1 cup of canned evaporated milk. There’s 1 1/2 cups of milk in that can. That’s just a weird thing to me. And I know I’ve written some recipes that ask for that, but that’s generally when I’m choosing to use evaporated milk instead of my refrigerated milk that I reserve for my kids… or my half & half that’s I reserve for my coffee… or the carton of heavy cream that I always have on hand, but only use for whipping. And then I’ll usually tell you to swap your favorite milk if need be. 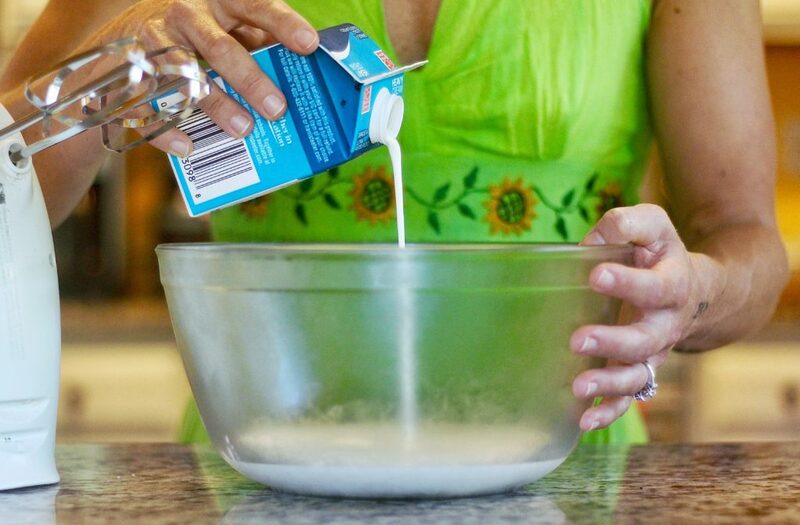 I love using it in certain recipes, because it’s richer without being ‘heavier’, in that it’s just milk with some of the liquid removed… kinda like the Greek yogurt of milks, if you will. But I know that I operate on the ‘no food wasted’ rule so when I have some leftover, I’ll find a use for it- whether it be in an omelette, or another baking project. 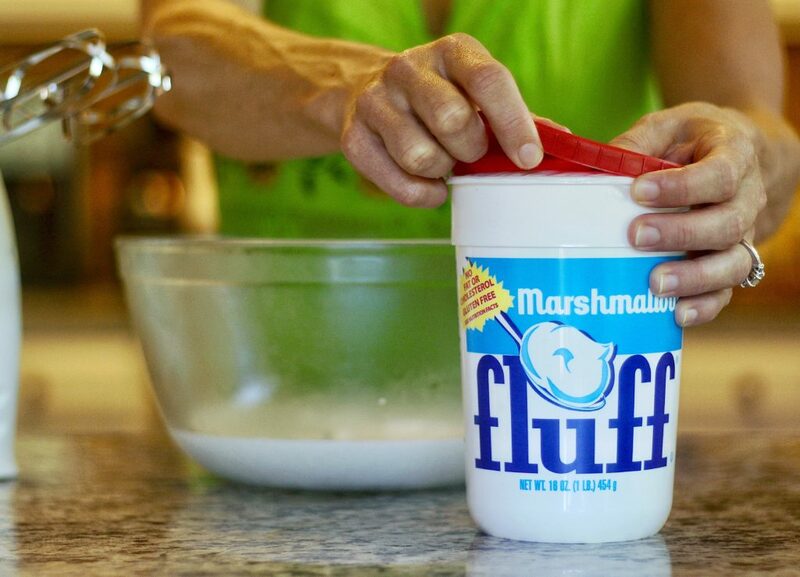 A lot of people just take out that 1 cup from the recipe and toss the rest and I will not stand for that. 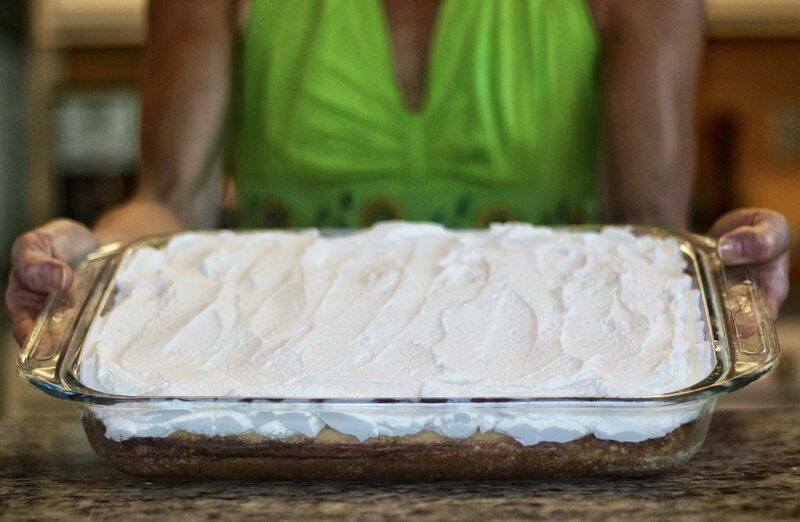 SO, when so many recipes for Tres Leches Cake call for 1 cup evaporated milk + sweetened condensed milk + heavy cream, etc… or say to use the whole can of evaporated milk AND THEN proceed to tell you to dump out 1 cup of the milks because it’s not needed…?!? I just eliminated the cream and went all in with the evaporated milk and sweetened condensed milk. No waste and you won’t tell the difference. Promise. Unless maybe your evaporated milk is skimmed, in which case please don’t complain to me because that was your choice. I also decided to just use a boxed cake mix. I know, I know, that seems unlike me considering I actually write recipes…including cake ones. But, there are totally places when a boxed mix is completely acceptable, in my opinion. Well, as long as you’re doctoring it up a bit… sorry, but I just think otherwise it’s kinda gonna taste like a box. In this case, when you’re wanting a dry cake anyway, I mean… maybe let’s just not waste our baking talent on making that happen, yeah? And they’ve started to make a lot of better boxed cake mixes now without all the gross stuff I don’t agree with eating. So be sure to read your labels and buy what you can pronounce. 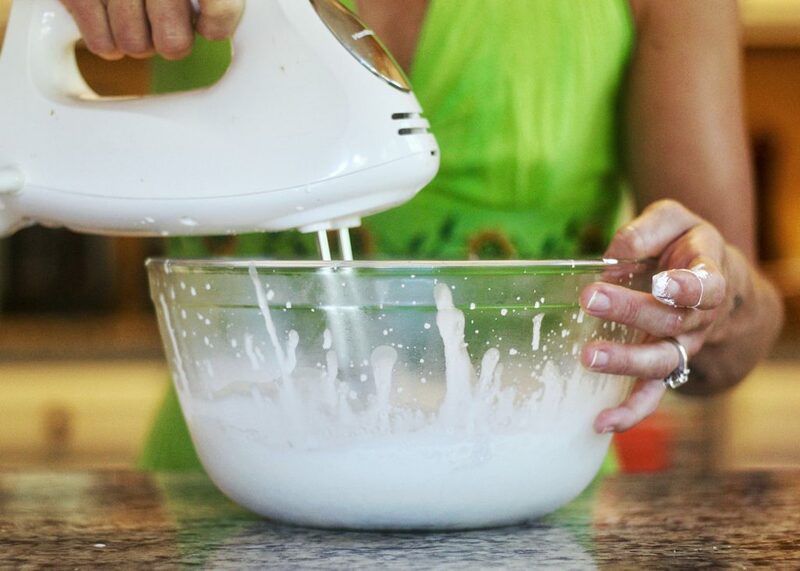 I also see so many recipes that tell you to invert the cake onto a platter before poking the holes and pouring the milk over, and I’m just like… um… why? Keep it in the baking dish, ya dummy. So. Yeah. This is a much easier version of an already easy cake. Which, to me, feels pretty damn good. Mine is heavy on the cinnamon flavor, with a hint of rum. And it’s not overly sweet or wet like some Tres Leches Cakes can be. It’s really one of the better ones I’ve had, and for sure the best one I’ve made. 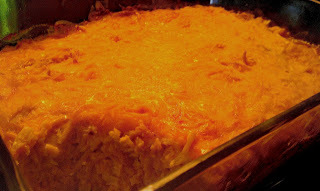 Everyone who’s tried it (including my texture specific daughter) LOVED it. Make it today. Or tomorrow. And it’ll be ready and perfect for your Cinco de Mayo celebration. Mix with an electric beater until lump free… a couple minutes. 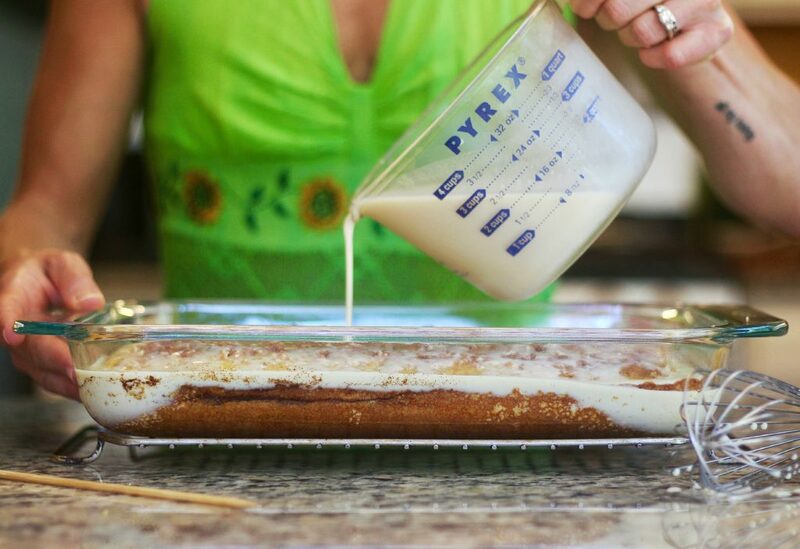 Pour batter into a greased 9×13 inch glass baking dish. Cool in baking dish on a rack for 30 minutes. Refrigerate while cake is baking and cooling. After 30 minutes, your cake should be room temperature at the warmest. Poke holes all over the top of the cake with a skewer, or fork. Poke like you’ve never poked before. Remember- the more holes, the more spaces for sweet milkiness to easily seep in. Remove milks from the fridge. Slowly pour the mixed milks all over the top of the cake, trying to be as even as possible so every slice is equally as moist. It will all seep through, promise. That’s what I love about this recipe… the cake absorbs all of it! And you’re using ALL OF IT! Allow the cake to cool completely (if not already) to room temperature before covering and refrigerating for up to three days before frosting and serving. When you’re ready to serve, ‘frost’ with whipped cream. 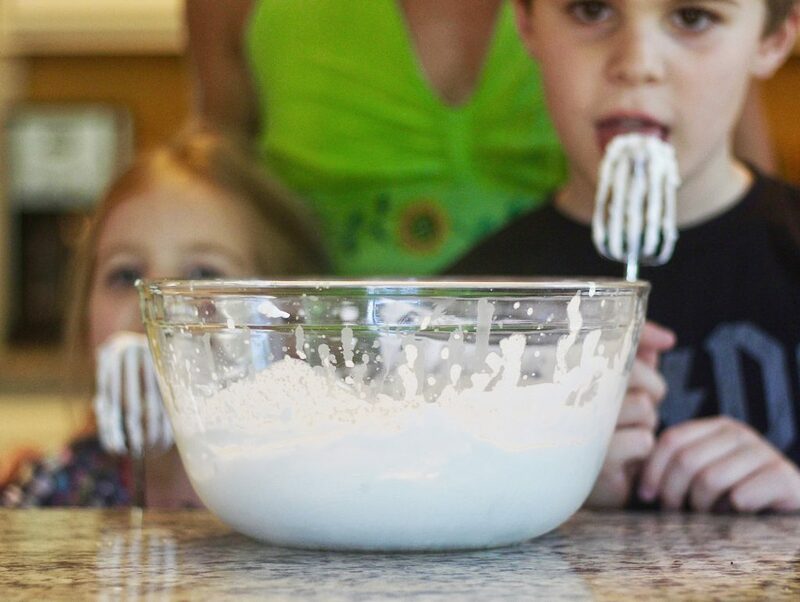 …and my secret whipped cream ingredient that guarantees my whipped cream will stay stiff and not fall for as long as I need it to…. Just one giant spoonful is good. Whip whip whip until you have stiff peaks. Watch your clothing. It spits. 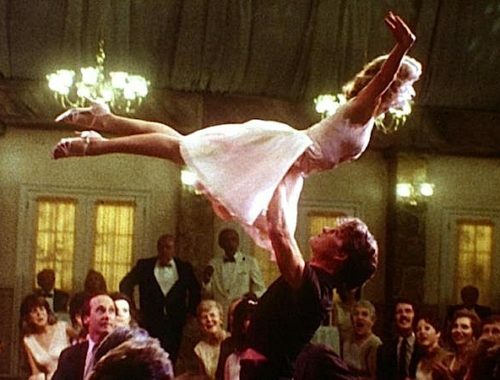 I like a super stiff whip for this. Wait for small people to sniff out some beaters in need of licks. Slather on the whipped cream and spread evenly over the cake. See how thick it is? That’s what you’re looking for here. And don’t miss a spot. The spatula is yours. You deserve it. Refrigerate again until completely chilled and serve cold! 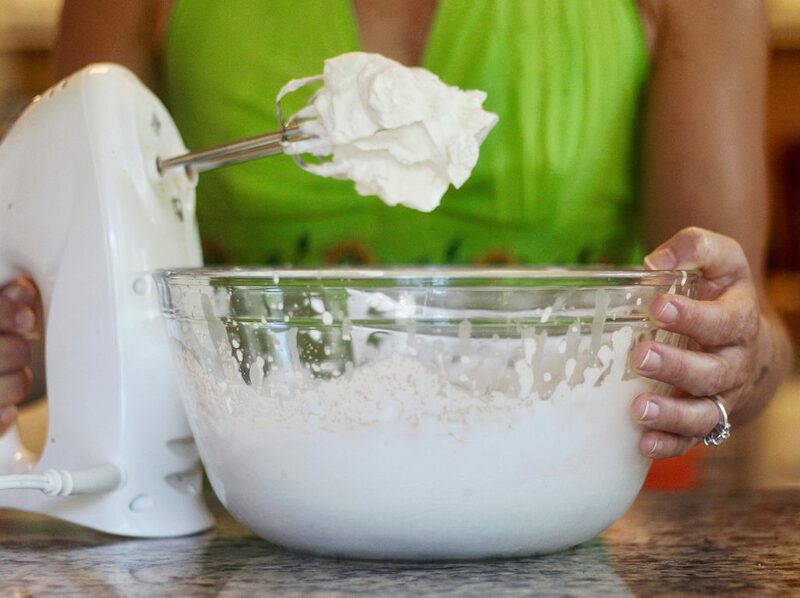 Add a scant cup of shredded coconut to the cake batter and use a can of coconut milk in place of the evaporated for a Coconut Dos Leches Cake. Top with coconut flakes- either toasted or not. Add a scant cup of raisins and up the rum amount to 1/2 cup (changing the water amount to 1/4 cup) for a Rum Raisin Dos Leches Cake. 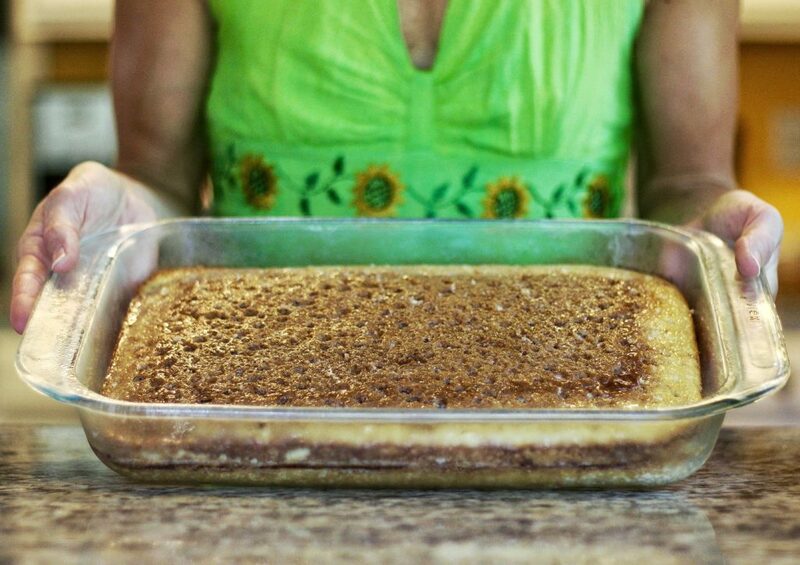 Add a can of crushed pineapple, drained to the batter and do the coconut milk swap for a Tropical Dos Leches Cake. Top with slivered almonds and coconut flakes. 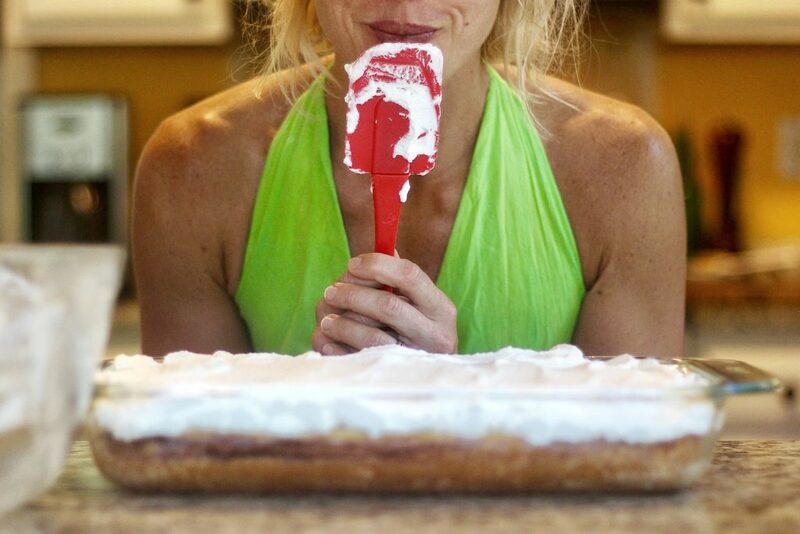 The photo looks as if you may have sprinkled the cinnamon on the cake before spreading the whipped cream topping? That would, I suppose, help keep the cream from weeping. I’m going to look right now for the can of evaporated milk that is somewhere in the back of my pantry–and I’m thinking, since I don’t have any run, that bourbon might make a good substitute. (I’ve already mentioned to you that I use a heaping tablespoon of jarred lemon curd [I have difficulty with the word “fluff”] to stabilize whipped cream.) I, too, have tried a couple of Tres Leches cake recipes and found them rather soggy. But I’m definitely trying this. Thanks, Abbey! Making this for book club. Will serve it to your mom and dad – will let you know their reaction – if there is one ;). 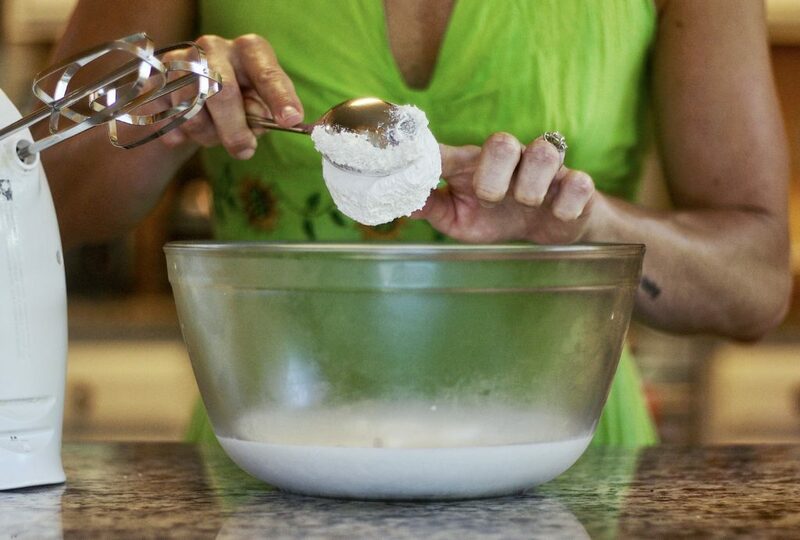 Abbey, I love this easy, delicious recipe–and it produces a cake with a great texture. I used what I had–so I substituted a spice cake mix for the yellow cake mix (fabulous with that extra cinnamon), substituted bourbon for rum (and, since I wasn’t serving it to children, also whisked a little bourbon into the milk mixture.). And I found that whipping a single cup of heavy cream (with a bit of powdered sugar, vanilla, and a heaping tablespoon of lemon curd) made plenty of cream topping to frost the top. But the substitution of butter for oil and/or water in the cake mix was magic. Thanks so much for this recipe–which, as you say, is infinitely adaptable.